With so many mundane items suddenly taking on digital life, it stands to reason that even textiles will eventually be digital in some form or another. 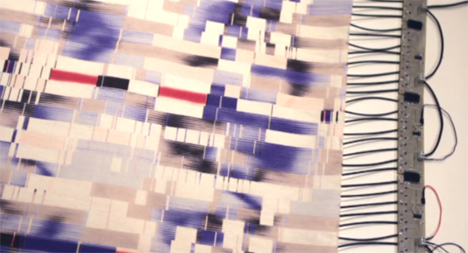 Budapest-based textile artist Judit Eszter Karpati recently designed a fabric called Chromosonic which changes color when exposed to heat and sound. 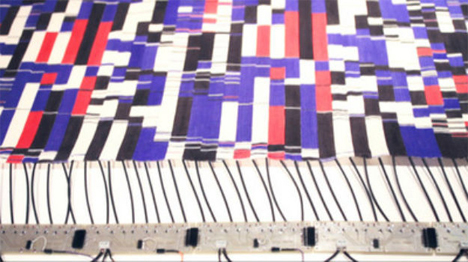 Chromosonic is a programmable electronic textile that reacts to heat using the open-source Arduino platform. Karpati first covered the fabric in silkscreen and then colored it with a heat-sensitive dye. The next step was weaving wires into the fabric and connecting them so that when music is played, the wires heat up and create color-shifting patterns. Karpati’s inspiration came from her desire to meld the physical and the digital. Her textile creation could, if adopted by the fashion industry, create some amazing new options for designers. The idea of integrating technology into clothing doesn’t stop with Karpati’s color-changing fabric, however. It is a positive step toward next-generation wearables in which we can combine clothing and electronic devices like phones, watches, and music players, which is an idea that some other designers have already expressed interest in developing.